Smartphone fans are excited that Research In Motion (RIM) just released the BlackBerry Bold 9000 that's able to sync up with iTunes, but may want to wait it out a while longer before upgrading. We can't front, the BlackBerry Bold is off the hook! The traditional QWERTY keyboard will make it a smooth transition to switch to if you're already familiar with the device. However, you know how you rush out to get the latest latest only to find out later that something hotter was about to drop. Well, it seems like that's what's up with RIM. According to the Boy Genius Report, there's a full touch-screen model coming soon in the 3rd quater most likely September. 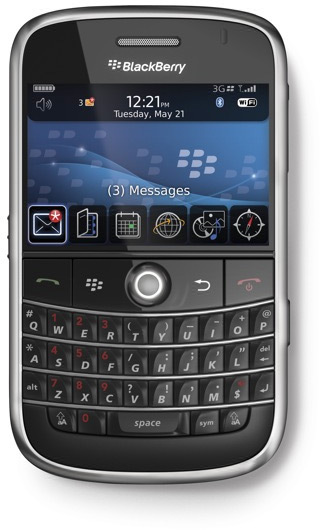 The BlackBerry Thunder 9500 is to be sold exclusively on Vodafone & Verizon's networks and will compete with the innovative Apple iPhone which is the 2nd most popular smartphone device. The pic is photo shopped but you get the idea. Wikileaks.org has been orderd by a federal judge to shutdown for allegedly leaking confidential documents detailing a Swiss bank's off shore activities (Julius Baer Bank and Trust Co. LTD. vs Wikileaks.org). U.S. District Court Judge Jeffrey White pulled the plug, granting a restraining order against Wikileaks barring it from "displaying, posting, publishing, distributing, linking to and/or otherwise providing any information" that the Bank Julius Baer considers to be confidential. The high-definition format war is over and Blu-ray has emerged as the winner over HD DVD. The epic battle ended a two-year-long face-off between the formats. "We carefully assessed the long-term impact of continuing the so-called 'next-generation format war' and concluded that a swift decision will best help the market develop. While we are disappointed for the company and, more importantly, for the consumer, the real mass market opportunity for high-definition content remains untapped and Toshiba is both able and determined to use our talent, technology and intellectual property to make digital convergence a reality." Several large retailers including Target Corp, Blockbuster, Inc. and Wal-Mart, with over 4,000 U.S.stores have chosen Blu-ray. Netflix, Inc. announced last week that it will stop carrying rentals in Toshiba Corp.’s HD DVD format and will be going exclusively with the rival Sony Corp. technology favored by five major movie studios. 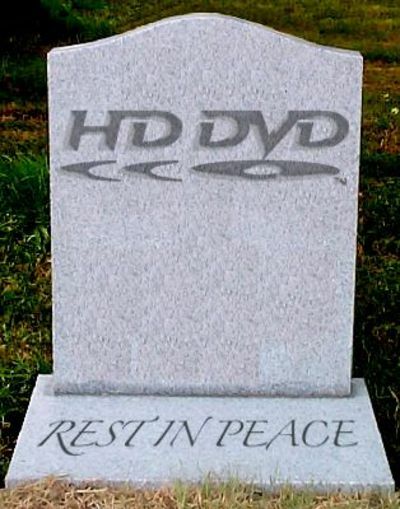 [SOURCE] CLICK HERE TO LEARN MORE ABOUT THE DEMISE OF HD-DVD. News of eBay policy changes aren’t going over well with sellers of the popular online auction website who are planning a week long protest by boycotting the site from February 18-25, 2008. Apple's revolutionary iPhone has arrived! Steve Jobs does it again, changing the world of technology forever as the much anticipated Apple iPhone finally hits the market. 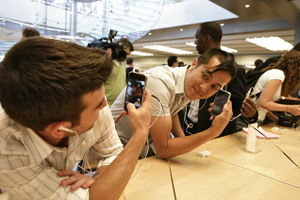 We're at the 5th Avenue Apple Store with the die hard who couldn't wait to get their hands on it. Check out our technology report for the latest on the New York City Premiere. In other news, everyone knows its been a busy week. We're excited to have been nominated for two "Bloggers Choice Awards" in the Best Video Blogger and Best Podcast Categories. It's easy to vote for us by clicking here or on the two Bloggers Choice badges on our blog page. Transformers ruled the boxoffice. Live Earth rocked the planet. And, the iPhone finally came out. However, CNET and the rumor mill at Gizmondo are already predicting that newer models will be released at Macworld as an iPhone Nano and widescreen ipod, without the phone capabilities. Click here to read the articles. It's estimated that Apple sold over 700,000 iPhones in the first few days of it's release and these upcoming editions are also expected to do well. Sony also announced that they're lowering the price of the Playstation PS3 consoles by $100 dollars which is sure to boost their sales and make alot of gamers happy. Harry Potter fans are happy that another installment in the series "Harry Potter and the Order of the Phoenix" is on the way. Although there has been gossip in Muggle Land that of one of the main character's will meet their untimely demise. Which means there will be one less student attending Hogwarts Academy. Also in indie film land, "Colma: The Musical" opened on July 6th. The musical about humdrum life in a small town has won top honors at several festivals. It also screened last fall in the "IFP : Best Film not Playing at a Theater Near You" Film series. We're also excited that the Smashing Pumpkins are making music again with their latest release "Zeitgeist". And we find inspiration in the bluesy voice of new songstress Sara Bareilles who recently toured with Mika. Our Binside TV Mobile Cast is also available via direct download, torrent or mobile stream. What a great way for night owls to spend a Friday night. We're up checkin’ out products and the midnight mix going down at the core of the cool new 5th Ave Apple store. DJ Ali Shaheed Muhammad, of the 90's Hip-Hop super group A Tribe Called Quest, had the crowd moving from his Macbook. It's iPod fever, check the vibes yall! Hosted by Shomari Harris. Produced, Directed, Edited and Cinematography by Shani Harris. Episode Edited on Mac Dual G5 with Final Cut Pro. Image Courtesy of Apple. Special Thanks to Apple.